Why Bail Agents Should Know Bounty Hunting Laws? TASER Certification IS NOT required to carry a TASER CEW in California. Bail Bond Company Owners may be held liable for what their bounty hunters do or don't do, and it is strongly suggested that any bounty hunter or any person bounty hunting seek out and secure Taser User Certification that is consistent with Bailspeak's highly respected curiculums. In the Bail Video above, Rex Venator Demonstrates how to get your argument out in 90-seconds and avoid being taken off-point by opposing counsel; indeed, Rex has been drafting bail bond motions and appearing in California Superior Courts as an agent for numerous sureties (Pursuant to California Penal Code Section 1305 subsection j & k) since 1998, and Rex has a 99.7% success rate in winning Orders to Vacate Forfeitures to Exonerate Bonds and with a growing number of recently filed bail bond motions receiving Notice of Non-Oppositions from county counsel and DA attorneys in numerous jurisdictions! 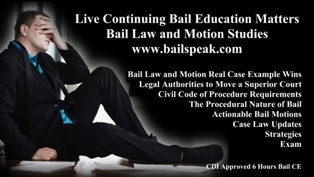 Your Bail CE Hours Applied within 24 to 48-Hours and Viewable on the CDI Website! Get 12 Hours in One Weekend! More TASER Combo Tac Med Classes TBA! Any person who is serious about bail would be remiss in believing that he or she would never have to apprehend a bail bond client or wanted felony fugitive irrespective of whether or not such a person has employed bounty hunters; indeed, emergencies happen without warning, and bounty hunters are not always there to repair the damage. 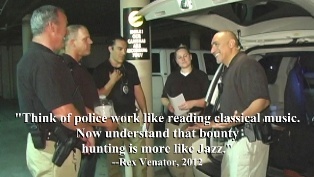 Are you or your bounty hunters carrying TASER products while bounty hunting? Please scroll down and take a moment to read the Opinion Editorial on TASER's Policy Changes and then double-check if any person purporting to be in compliance is meeting the duty of candor. 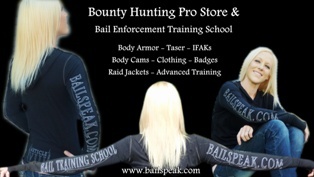 WOULD YOU LIKE TO PICK UP YOUR BAIL ENFORCEMENT GEAR AT YOUR BAILSPEAK Continuing Bail Education and/or 20 HOUR BAIL AGENT PRE LICENSING CLASS? CLICK ON THE “Bail Equipment Store” Menu Tab to your upper left to Visit Bailspeak’s Newly Renovated Bail Enforcement Online Bounty Hunting Gear Store or Please See the Below Video for More Information about its current and upcoming bounty hunter supplies. Have Your New Hires Reported Other Bail Education Instructors "Throwing Paper at them." 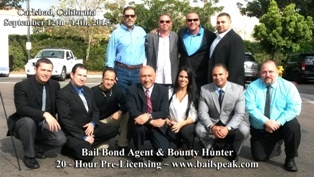 This 20 Hour Bail Agent Pre Licensing Course is “Approved” by the California Department of Insurance and is required to both advance in the California Bail Agent Licensing process, and it also satisfies 50% of the legal requirement to lawfully bounty hunt in California within the meaning of California Penal Codes beginning with Section 1299.01, inclusive. Bailspeak has embraced the old school hardcopy business methodologies and has circumvented all online and so-called “cloud” offers in favor of doing what it takes to protect your personal information to the extent that Bailspeak does not keep any digital records of its students and has never been breached like the major corporations and banks; moreover, Bailspeak does not sell your information to third parties. The responsibility to provide the timeliest, relevant and most on-point bail education as a vendor to the mom & pop bail shops and major bail bond agencies in California is taken very seriously, and employers can rest assured that their new hires will not, as has been continuously reported concerning other bail education providers and their instructors, be molested by headhunting recruiters in, at or around any Bailspeak class, nor will any of their new hires be offered “paper” or “surety applications” or anything else that violates the trust between bail employer clients and the Bailspeak Bail Education School commitment to respecting its clients. 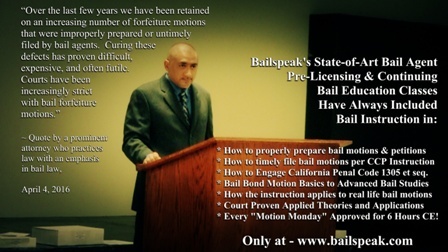 Bailspeak’s highly respected industry wide reputation as California’s Most Transparent, Most Trusted, and Fastest Growing Bail Training School in California has remained intact and has been fiercely guarded and is now going into its eighth year in full-time operations. Get up to 12-Hours of Bail CE every Sunday & Monday of Every Bailspeak Class Weekend with Your Hours Applied Inside of 24 to 48 Hours! Are you looking to for the best educated fugitive recovery agents, trained in lawful bail enforcement, and with many who are now conducting bail fugitive recovery in all of California’s 58 counties? The facts are these: untrained, poorly trained, and misguided bounty hunters are increasingly being arrested, charged, and convicted and with personal injury lawyers now starting to take on, however frivolous due to ignorance of bail such suits may appear, and are filing civil suits and naming whoever hired the errant bounty hunters, the bail agency owners, the general bail agents, and with sureties as the main goal of the law suits. 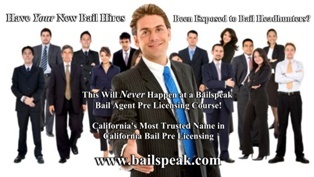 Bailspeak Alumni undertake the timeliest, relevant, and most unrivaled bail agent pre licensing immersion course available in California, and, arguably, the Nation. Are you looking for the best educated bail agent employees to post bail bonds who know what is legally permissible and what is not inasmuch that they can operate legally and not get their employers in criminal or civil trouble? 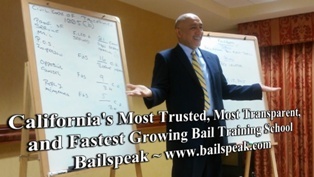 Yes, Bailspeak Alumni are the most sought after new hires by California’s top Bail Job Recruiters; moreover, Bailspeak is the First Choice for bail education pre licensing in California and for a great many reasons. See below California Bail Agent Class Photos present a visual of the finest people who have entered into the bail industry and with some now looking to help you save or grow your bail business by good underwriting or lawful bounty hunting. You Pay all travel and lodging expenses plus approximately $390.00 for the online and practical course; You Pay an Annual $1,200.00 Licensing Fee, Taser Collects Online Fees from each of your students; You then Pay TASER a Percentage off of each Student you bring in; You Pay for all Training Materials, You Pay TASER for training cartridges and other TASER equipment; You Pay for all class rent; You Pay for electricity, air and heat, and YOU repeat the process early and often for the insidious privilege to Pay TASER in able to Create Your Own Future, Replicating Competition. In response to some queries as to why I opted NOT to renew my TASER Instructor Certification Certificate for the 4th time, the above has been posted on a Bailspeak Sister Website, but, more importantly, how many people can really comply with the above and utter antithesis of even beginning to exist in the Free Market as a TASER Certified Instructor? It all sounds like a great idea in the furtherance to Protect Life ~ really? What happens if, however unlikely and due to Free Market realities, the private security and bounty hunting industries suffers a deluge of so-called “train the trainer” instructors? Is this strong likelihood a good thing or bad thing when it comes to protecting the public? 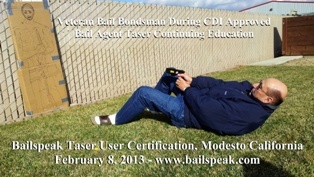 The good news is that there is NO CERTIFICATION REQUIREMENT to carry a TASER CEW® in California, and Bailspeak still offers both TASER CEW products and a Tactical TASER CEW Training Course that counts for 6 Hours of Continuing Bail Education—without TASER’s newly oppressive monetary requirements. Furthermore, I learned that TASER personnel erroneously “assumed” that each of the posted Bailspeak Class Photos were somehow TASER classes and not Bail Education Training Classes and therefore decided to revamp how it collects money from prior TASER Certified Instructors—Count me out; I am not and have never have been a TASER Kool-Aid drinking minion to the extent that any and all lawsuits that predate 2009 are, reportedly, not being adamantly contested by TASER and TASER devices older than 2005 should be immediately taken off line for, well, to protect the public. DOUBLE CHECK if the ostensible TASER Instructor who “certified”you on CEWs knows about and has met with the above NEW requirements. If not, TASER personnel have clearly stated that they will not recognize such certifications and have been known to suddenly change policies and retroactively engage in “...wide sweeping enforcement...” to literally renege on what many folks have paid for and relied upon in good faith and without prior notice and No Refunds. Author’s Opinion Note: I concluded after several telephone conversations with TASER personnel that the above is what happens when people who have always collected paychecks and never had to make a payroll as a business owner, by and large, takeover the training department of a business. * TASER and CEW are each Registered Trademarks of TASER International, Inc.
Are You Bounty Hunting Legally? Those BAIL LICENSEES who were licensed prior to January 1, 1994 there is no PC 832 40 Hour Power of arrest education requirement. For those persons licensed by the department as a bail licensee between January 1, 1994 and December 31, 2012, a minimum of 12 hours of classroom pre-licensing education is required. Those bail licensees licensed after January 1, 2000 may not be aware that California law requires certification compliance to legally bounty hunt that includes no less than 20 Hours of California Department of Insurance Approved bail agent pre licensing in combination with completion of a 40 Hour California P.O.S.T PC 832 course in the Powers of Arrest—Not the Security Guard Course. The California Department of Insurance does not recognize nor will acknowledge the commonly used expression “grandfathered in” to the extent that bail agents are now reporting courtesy calls from government officials to either get PC 1299 compliant or risk being criminally charged for illegal bounty hunting in addition to summary judgments arising from illegal bounty hunting with respect to the bail motion process. Those bail agents who attend Bailspeak’s 20 hour bail agent pre licensing class can also secure up to 12 hours of California Department of Insurance Approved Continuing Bail Education and all of which in the same 3 day weekend. Bail agents with 10 and even up to 30 plus years of experience are going on the record and strongly suggesting to their colleagues that Bailspeak’s live Bail CE classes will bring them into legal compliance and, just as important, up to speed on the current events, bail motion precedent updates, and other related law changes concerning the California Bail Industry that is unquestionably evolving at the speed of a text.